Image caption The fire service said the bull "seems none the worse for wear for the ordeal"
A bull got its head stuck in a tree and was trapped for more than an hour, prompting a call to firefighters to rescue it. 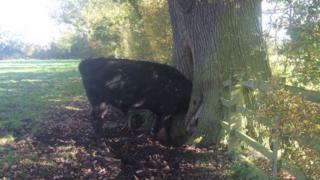 The bull, named Billy by crews, was freed within 90 minutes from the tree in a field off Barnaby Road, Rugby. Two fire engines and the Large Animal Rescue Unit from Rugby were deployed after being alerted at about 10:55 GMT. The animal "seems none the worse for wear for the ordeal," the fire service said. It said "a winch, strop and riot shield" were used to remove the bull.